The Roadside Distractions are a trio of talent (and gardening knowledge!) 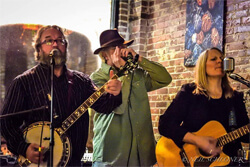 comprised of Julie Weisenhorn (guitar, vocals), Gary Cobus (banjo, dobro, vocals) and Karlos von Veisenhorn (harmonica, vocals). Enjoy covers of your favorite hippie music laced with bluegrass, country and even a couple singalongs. The Roadside Distractions appear monthly at Lupine Brewing in Delano, and look forward to their Arboretum gig with Music in the Gardens.